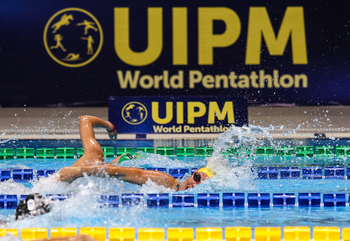 Rio 2016 Olympic champion Chloe Esposito of Australia won Women’s Individual gold at the UIPM Pentathlon World Cup Final for the first time after a typically determined fightback. Sarolta Kovacs of Hungary had started the Laser-Run with a lead of 13 seconds but Esposito (AUS) gradually reduced the deficit and then overtook her rival on the final visit to the shooting range. Kovacs, the 2016 world champion, summoned the strength to hang on for silver and there was a shock bronze medal for Gintare Venckauskaite of Lithuania, who had embarked on the Laser-Run in 24th place but surged through the field to reach the podium ahead of 4th-placed Natalya Coyle of Ireland. Behind them, Uliana Batashova of Russia claimed 5th place and Shino Yamanaka of Japan finished 6th in a major boost to the pentathlon team from the Tokyo 2020 Olympic Games host nation. 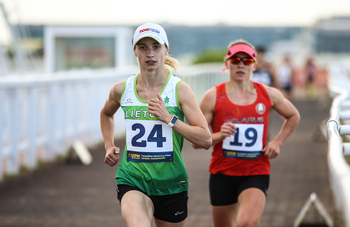 The results demonstrated the importance of momentum and form during the Pentathlon World Cup season – Esposito (AUS), Coyle (IRL) and Batashova (RUS) all won individual medals during the recent European competitions in May, where Kovacs (HUN) won a Mixed Relay gold. Behind the top six, the ever-consistent Anastasiya Prokopenko of Belarus finished 7th and 2017 world champion Gulnaz Gubaydullina (RUS) crossed the line 8th. Esposito’s victory came on the back of her comeback success at Pentathlon World Cup Kecskemet in May, and the 26-year-old was thrilled with a performance that promoted her to No.2 in the world rankings behind Gubaydullina (RUS). “My fencing performance was the best I've ever had in my life so I was really happy with that, and then I equalled my personal best in swimming,” said Esposito (AUS), who took the entire year off in 2017. "In the riding I was so happy to have a clear round and then I went into Laser-Run in 2nd place, which is strange for me because I usually start further back. I was a little worried I wouldn't handle the shooting pressure but everything went well. "When I'm in competition I only focus on myself and not the people around me, and that's what I did in Rio. Sarolta is a good friend and a very good competitor so I knew it was going to be tough today. But if someone is in front of me, I just try to chase them down." 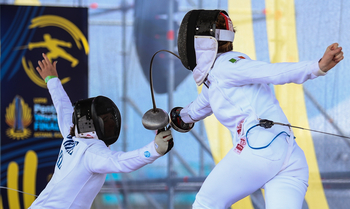 Kovacs (HUN) said: "It was a hard competition but the key for me was fencing. Swimming is my favourite event and I had a good result, and in the riding I only had one knockdown. "I started Laser-Run in first position and I knew Chloe was there, but I felt in good shape for the first three laps. At the fourth shoot I gave away a lot of time, but I'm so happy with my second place." Venckauskaite (LTU) added: "My Fencing was very bad, but I said I would do my best and in the end it was a very good day for me." Gubaydullina (RUS) was quickest in the pool with a time of 2:09.05, ahead of Kovacs (HUN) in 2:10.79 and Elodie Clouvel of France in 2:11.68. Esposito (AUS) was not far behind (2:11.69) while Bian Yufei of China timed 2:12.77. The outstanding performer in Fencing was Ekaterina Khuraskina (RUS), who scored an excellent 27V/7D while Iryna Prasiantsova (BLR) managed 24V/10D and Kovacs (HUN) moved into a strong position with 23V/11D. Esposito (AUS), Coyle (IRL) and Yamanaka (JPN) all managed top-10 finishes in the Ranking Round which counted in their favour in the final reckoning. Volha Silkina (BLR) managed three victories in the Bonus Round before losing to her compatriot Prasiantsova (BLR), who was the last woman standing and added two points to her overall score. There were an incredible eight maximum scores of 300 in the Riding arena, with Esposito (AUS) and Khuraskina (RUS) among the athletes celebrating the relief of an unblemished round. Kovacs (HUN) only dropped seven penalty points, with the result that she would start the Laser-Run in 1st place with a 13sec lead over Esposito (AUS) and 17sec over Khuraskina (RUS). The other athletes who enjoyed a clean round were Yang Soojin of Korea, Marie Oteiza (FRA), Sive Brassil (IRL), Batashova (RUS), Venckauskaite (LTU) and, to the delight of the home crowd, Ardak Akhidullayeva of Kazakhstan. 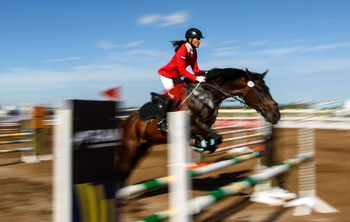 Ilke Ozyuksel of Turkey was the only athlete who suffered elimination, demonstrating the high standard of Riding. Kovacs (HUN) showed the composure of a world champion for the majority of the Laser-Run, but ultimately she was up against one of the world’s best Laser-Runners and needed a greater advantage if she were to prevail. The lead did not change until the final shoot, however, as Esposito (AUS) took 23sec over her second shoot and even lost ground to the chasing pack briefly. Coyle (IRL) looked like the strongest contender in that pack, but she was finally undone by an extraordinary performance from a woman who started 20 places behind her in 24th. Venckauskaite (LTU) was 4th in the 2016 World Cup Final in Sarasota (USA) and also missed out on the podium by just one place in the 2016 EMPC European Championships. 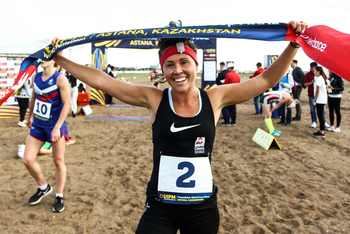 Again she was 4th in 2018 Pentathlon World Cup Cairo, so it was an incredibly sweet moment for her to secure a podium place after a truly exceptional Laser-Run on the demanding sandy ground. With a time of 12:14.40 she was more than 30sec quicker than any of her rivals on the day. Ahead of her, it was once again the Esposito show as the Olympic champion built on her comeback success at Pentathlon World Cup Kecskemet and ground her high-class opponent down. Kovacs (HUN) finally relented with a 19sec shoot on the final visit to the range, while Esposito (AUS) was in and out in 10sec and never looked back. UIPM President Dr Klaus Schormann said: “The first day of the UIPM 2018 Pentathlon World Cup Final in the capital city of Astana has been arranged at a high level. “Kazakhstan is known as a horse country and we could see this throughout the Riding element of the competition, to the benefit of the athletes. 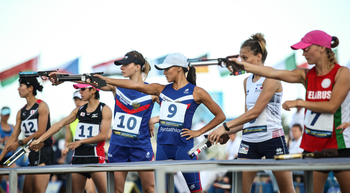 “Modern Pentathlon has a long tradition in Kazakhstan and this World Cup Final will be a great source of promotion for our movement in Central Asia and around the wider world. 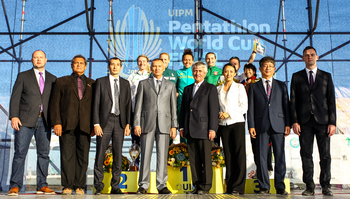 UIPM Pentathlon World Cup Final Astana continues on June 23 with the Men’s Final, followed by the Mixed Relay on June 24.